So yes, when I created the poll at the end of 2012, the “over or not” discussion hadn’t really finished. I’m sure we would have had even more responses if the issue stayed unresolved through the month. I tried to make sure there were some easy “more important than” and “less important than” sorts of answers. For example – I didn’t think anyone could answer that going over the fiscal cliff was more important than the bombing pf Pearl Harbor. By the same token, I tried to put in several “probably more important than” sorts of answer. 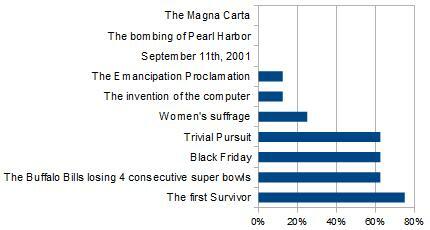 Who knew some people would think that the whole fiscal cliff issue was less important than the first Survivor show? Select each item that going over the fiscal cliff is more significant than! I gotta say – it seems to me that perhaps slavery, the whole women’s movement, and even the computer industry got a bum rap from some of the poll takers. My first inclination was to find some way to ask about age discrimination in the workplace, but I just couldn’t come up with a useful way of asking that question. Instead, I got to thinking about different types of discrimination and wondered which people see more often. There’s no wrong or right here – but I’m curious which you see more often in the work place. Find it just over to the right and up.